Zatanna is coming to Injustice: Gods Among Us! Oh boy. My copy of Injustice: Gods Among Us just pulsed with magic-sauce. (Ew. I immediately regret that phrasing.) A press release dropped today that backwards-spell-uttering Zatanna will be the next DLC character for the DC universe fighting game. Thanks, IGN for your awesome embed code! Frankly, she looks pretty fantastic and adorable. I mean, I didn’t need her costume to be all that chesty (it is a video game after all), but basing her game model off her classic costume was a smart call. Her move set looks INSANE. A special that allows for wand-usage, complete with range attacks? How about the slow-moving fireball, which, when used in conjunction with a teleport, could leave your opponent completely unable to block the attack! She also breathes fire, and flings a deck of cards at her enemies. I’ll be seeing you next week Missy. I have to give the folks at NetherRealm major props here. Almost every character in Injustice plays, feels, and looks like their comic counterparts. Zatanna looks to be just the latest near-flawless interpretation. Frankly, the game desperately needs more female characters that aren’t directly associated with Batman. Zatanna is a great choice and one that the fans will appreciate. 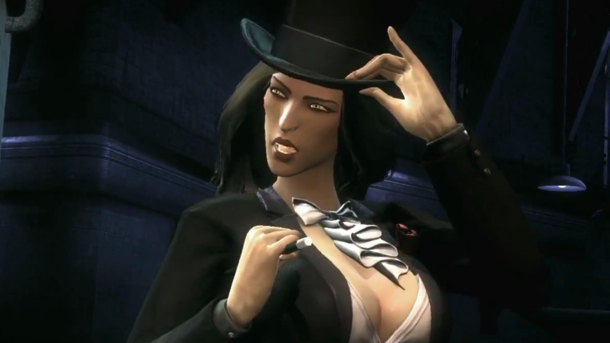 Zatanna will be available next week for $5 for the PS3 and Xbox 360 versions of the game. ← The Second Trailer for Thor: The Dark World is Glorious.